The past week has felt like a failed attempt at finding balance. I spent the week before last on glorious holiday with two guy friends in gorgeous Crested Butte, Colorado. It was a vacation in every sense of the word; each day began with a big, home-cooked breakfast, followed by a long, easy-going game of Scrabble with frequent mimosa refills. We soaked in a steaming hot tub at least once daily, surrounded by snow and those mountains, the sleeping giants whose mercurial personalities shifted as the sun rotated overhead. We savored the best pizza of our lives at Secret Stash—it was the kind of food that, once delivered, hushes all conversation except for occasional slips of profanity between bites. I squeezed into my mom’s retro one-piece ski suit and skied down the green slopes, making it down the mountain with all parts intact. In short, it was marvelous. The following week, last week, was spent in a wretched state of catch-up from the week before. Deadline was rapidly approaching and I worked, hunched over my laptop, from the time I woke up to the time I dragged myself to bed. Warm memories from the last week made it possible to accept the situation, but it is absolutely not how I want to live. By the time I finished working late in the afternoon on Sunday, I sought out some companionship. Sometimes you just have to stop what you’re doing, climb onto the roof with a friend and sip on some cheap Champagne, am I right? Deadline has passed, and I find myself overwhelmed by other projects (please join The Food Matters Project! ), but I’ll make it. This weekend has been all about finding balance: stretching out my poor back with Pilates, dancing around to my friends’ band at a dive bar and tackling the disgusting pile of dishes that is taking over my kitchen. I’ve already typed up more than I intended, but let me tell you about this pecan butter. The idea for pecan butter came to me on the drive back from Colorado, right after I’d awoken to see mountain goats outside the window. I munched on a cracker, then a couple of pecans that Peach Crest Farm had gifted Matt for Christmas. The Peach Crest Farm pecans are extraordinary; one taste of those fresh, local, organic pecans convinced me that every pecan I’ve ever tasted has been rancid with old age. My grandmother Mimi‘s family owned a pecan farm and she adored pecans. Now I know why. I munched on a couple more pecans, and another cracker, wishing I could smear the pecans on top like peanut butter. Bingo! Pecan butter. One quick google search confirmed that it could be done, but no one has given pecan butter the attention it deserves. I’ve tried to make peanut butter before with disappointing result, but not so here. Pecan butter is the least finicky all-natural nut butter I’ve come across. 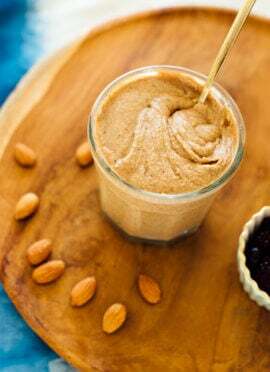 Toasted pecans meld together in a food processor, turning into silky smooth, spreadable nutty goodness with maple undertones, without any added oil. A pinch of salt and a dash of cinnamon at the end make it positively divine. If you love pecans like I do, you must give this a try. It is truly luscious. Pecans are not cheap, but I assure you that pecan butter is worth every penny. It is liquid gold. Might I suggest that you slather it on a piece of my favorite honey-sweetened banana bread, as I have every morning this week? It makes a healthy breakfast that tastes almost as decadent as a piece of cake. 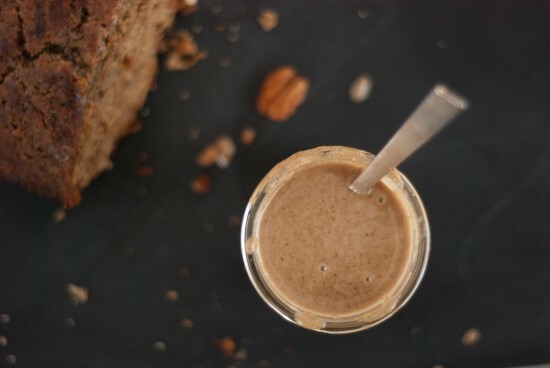 Pecan butter is easy to make and tastes absolutely incredible! Feel free to to double or maybe even triple the amount of pecans in order to make a bigger batch (you may find it easier to toast the pecans in the oven at that point). Recipe yields 1 cup as written. 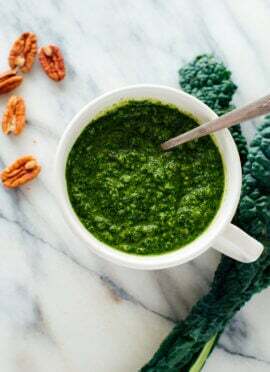 Pour the toasted pecans into a food processor or high-speed blender and let them cool for several minutes. Then blend the pecans, pausing to scrape down the sides with a spatula often. The mixture will be crumbly at first, but will eventually blend into super-creamy goodness. Be careful not to let the mixture get too hot, which seems to cause oil separation. You might have to stop and let the mixture/machine cool down for a bit just to be safe. 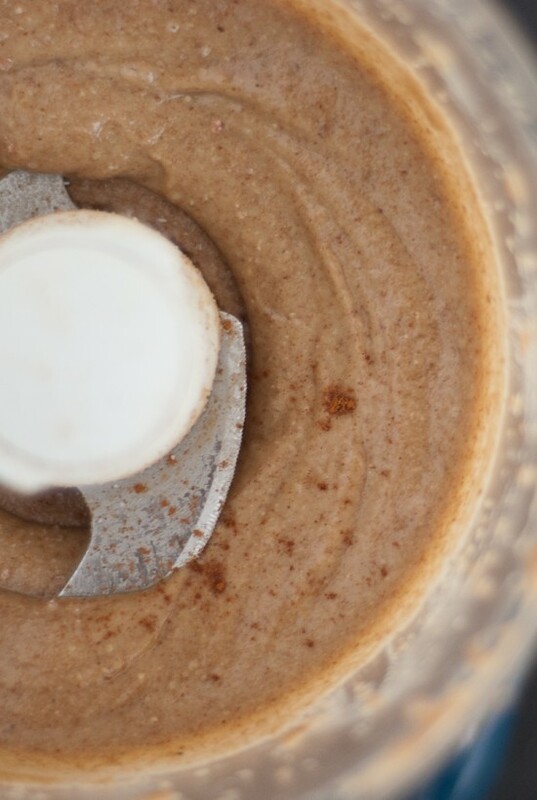 The amount of blending time required really depends on your machine—my old food processor took ten to fifteen minutes to turn the pecans into pecan butter, but my fancy Blendtec and Vitamix blenders can turn it into butter in a minute or two. Pour into a small jar, seal it with a lid, and store it in the refrigerator for good measure. This pecan butter will keep well, refrigerated, for up to 1 month or so—obviously, don’t eat it if you see or smell any signs that it has gone bad. This pecan butter is only as good as the pecans you put it in it. Seek out fresh pecans from a store with high turnover. Bonus points if they’re local, organic and/or stored in the refrigerator. I haven’t tried this before! What a great idea! This looks mouth watering good. I’ve been meaning to make nut butter in general since getting a “big girl” food processor for Christmas and yet somehow I haven’t yet. This looks like a great one to start with. Easy, few ingredients and my husband is a pecan fiend! 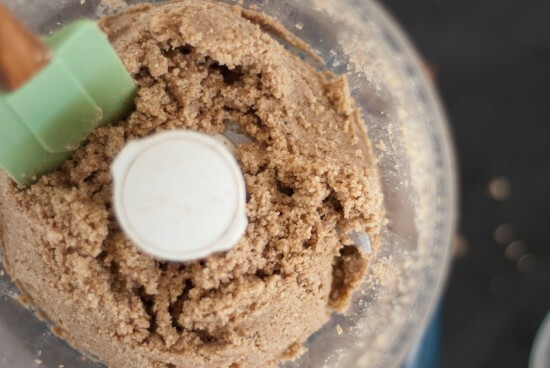 This recipe will make you fall in love with your new food processor, I promise! And your husband will love pecan butter, no doubt about it. just to be sure, you run the processor for a 15 minutes straight? Hi Lynda! Just run it until the pecan butter is creamy and smooth, which might take less than 15 minutes in your machine. Oh my goodness, I need this in my life. First thing I will be doing in the morning: making pecan butter! If I had to choose, pecans would be my favorite kind of nut – so I really must make this pecan butter! Loooooove pecan butter. HOLY mom. Oh. my. goodness! During the week, I pretty much eat toast with peanut butter on a near daily basis, and as much as I love it, it gets old pretty quickly. Pecan butter would be such an easy, refreshing change of pace! I’m definitely going to have to try this (and pecans are by far my favorite nut). Thanks, Kate!! I’m a huge fan of different nut butters and this looks like no exception! Pecans are so beautifully soft and sweet I can imagine it tastes incredible on that banana cake. Yum! Oh my goodness! I am a nut butter lover, but I’ve never thought to try pecan butter! This looks and sounds phenomenal! Will try to make asap! Thanks, Kate! Also, would you be able to post the recipe for the kale, mushroom and avocado frittata? It looks so scrumptious!! P.S. I adore your blog. Your posts are wonderfully written, and the photography is beautiful! Thanks for commenting, Veronica! My friend Matt improvised the frittata that morning, but here’s the basic concept: https://cookieandkate.com/2010/the-perfect-frittata/. Just sauté chopped kale and mushrooms in a bit of olive oil for a few minutes, let it cool a bit, then mix it in with the eggs and other ingredients. Bake as directed and top with sliced avocado. I absolutely love pecans, so pecan butter sounds like a fantastic idea! It looks delicious!! I’m so surprised that it’s just the nuts you need and it gets this creamy. I actually have a reaaaaally big bag of pecans that I got at Costco, which I’ve been worrying might go bad. This would be a perfect solution! Ta da! It is the perfect solution. If you’re patient and scrape down the sides often, the pecan butter gets silky smooth. I was surprised, too. Besides being easier to make, how’s pecan butter compare to peanut or almond butter as far as taste goes? I’m a huge peanut butter fan and enjoy almond butter, but I dare say that pecan butter tastes better than both of them. 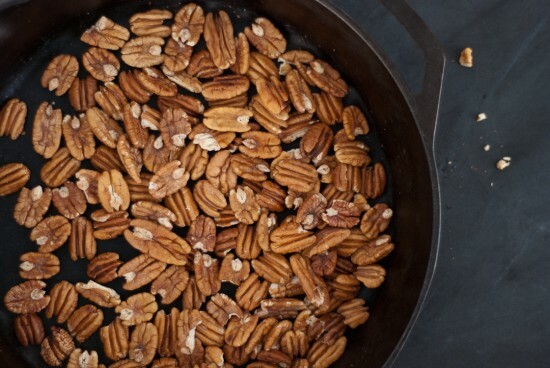 Assuming that you’re using high quality pecans, it tastes incredible. Sounds like I’m gonna have to round up some cash for some pecans then. Pecan butter will be a perfect match for my plain bread and vanilla muffins. Thanks for a multipurpose recipe post! Pecan butter is one I have yet to try to make, but it’s going to be next on my list for sure now! This pecan butter looks delicious! I love how creamy and smooth it looks. Once I make it, it’ll definitely be a new morning ritual! This is exactly what our food lovers love to see on our community page! We’d love if you’d check it out and contribute! http://bit.ly/yI0sZU Cheers! A lovely vacation and inspiration for liquid gold? That’s the best :) It looks fantastic! I’ve made pecan butter before, and I like to describe the taste as Christmas in my mouth – it always reminds me of pecan pie and Christmas! Thank you, Jennie! I was a photographer before a cook, but I am always trying to improve my food photos. Glad to hear that you’re following along! Sounds like the perfect vacation. Ooo I’ll have to make this next! I’ve tossed a few pecans in with a batch of almond butter, but I’ve never made just simple ol’ pecan butter. I can’t believe how silky smooth it looks, too. Looks rather soupy in the photos. Is that the typical consistency? Hi Harvey, the pictures above do show the general consistency, but it is not soupy in real life. Pecan butter is more spreadable than peanut or almond butter, but definitely not drippy. It’s just ridiculously smooth! We had dinner at an Applebee’s the side dish was mashed sweet potato with maple pecan butter. OMG it was so good. Their pecan butter was blended with unsalted butter,and pure maple syrup..my thought is this might be a way to use a failed batch (by mixing in butter to the batch that separates the oils rather than throw it away) just a thought. This butter added pecan butter could also be used in cookie dough. I made a batch of pecan butter today following your recipe and it tastes heavenly! I kept eating spoonfuls out of the jar all afternoon. And I just LOVE how drippy it is. Can’t wait to try it on oatmeal, toast, apple slices, and anything else I can think of! Isn’t it the greatest?! I think my favorite is banana bread with pecan butter. My mom recently realized that she is sensitive to peanut butter so I plan to make her some pecan butter for Mother’s Day! Do you know how long it stays good in the fridge? Hey Cat, I don’t know for certain but it should last about as long as whole pecans or other natural nut butters would. I think it would keep for a few months or more. HELP! I don’t know what I’m doing wrong! I tried to make this twice, and both times I ended up with a very lumpy consistency and the oil was totally separated. What did I DOOO?!!?!? Uh oh, I’m so sorry to hear you’re having trouble! I have made pecan butter using the method described in my post about 5 times and that has never happened to me. I’m using high quality local and organic pecans, are you sure yours are still good? Could it have to do with your food processor? I’m really surprised to hear that the oil separated because the oil never separated in my batches, even after sitting in a jar for a couple of weeks. I’m baffled, truly! I’m sorry! Thanks for getting back to me so quickly! These pecans were from my husband’s aunt’s tree, but they were a Christmas gift and I had frozen them. Maybe that has something to do with it? I will try again with fresh pecans and report back! After doing so experimenting I figured out that my pecans (which had previously been frozen) have a threshold where they go from crumbly to oily, so the next batch I caught them before they got oily. I then hand mixed in 2 tbs of coconut oil and a little honey until it was nice and creamy. It worked! The stuff is delicious! I’m so happy because my daughter is allergic to peanuts and therefor I can’t buy pecans from the store (they all have “may contain traces of peanuts” warnings.) I can’t stand store bought nut butters, so this is a life saver! I’m so glad you figured it out, Alida! Somewhat ironically, I just posted a coconut butter recipe today. If your daughter likes coconut, you might give that a try! Thanks for this comment! The first time, I Meade this, it was heaven, but this time, it is greasy and clumpy! I must have over blended. What a pain, it’s probably $13 in pecans! We have still a lot of pecan nuts from our tree, so I gave it a try. I don’t have a food processor- only a hand held blender- so maybe that’s why it did not turn out creamy… but it is so delicious! Just love it. I added a spoon full of date honey for a version that is a bit sweet. Just made this with pecans from my backyard and it was DELICIOUS. I did not have any cinnamon so I added a dash of vanilla extract. Thanks for posting this simple recipe, it gives me a way more practical use of the pecans falling in my backyard rather than just pecan pie! You’re welcome, Julie! I’m so glad you love the pecan butter as much as I do. I’m just as obsessed with it this year as I was last year. I ran out of my jar this morning (it’s so good in oatmeal) so I’ll have to make more pronto. I wish I had access to a pecan tree. Fresh pecans are incredible. After hearing how much my parents loved some pecan butter they received, I decided to make my own version for them as a present. Your recipe turned out amazing! (I made a preliminary batch to ensure later success). My friends are still surprised that it came out so well with no extra (canola) oil. I have decided to make your banana nut bread in addition to the butter for a Christmas morning treat for my family. My only question is how long do you think the flavor will be optimal when stored in the refrigerator? Not that it has a chance of surviving very long! So glad you’re enjoying the pecan butter, Brittany! I haven’t noticed the flavor diminishing at all over time, but I’m always polishing off my batches in under a month. I wouldn’t worry too much about it! I followed your recipe and the butter came out bitter! I’m sorry to hear that, Owen. Did you try your pecans before you blended them up? The only explanation I can think of is that your nuts went bad/randcid before you blended them. Hi Ale, I’m sorry your pecan butter isn’t turning out well. I wonder if it’s due to a difference in our pecans or food processors? If it ever seems like the oil is separating from the nuts, stop and let the mixture cool down, then try blending it together again. I’m sorry, I wish I knew the answer for you. I’ve never had pecan butter but it sounds lovely! I love pecans. I was pleasantly surprised to find that the farm we just purchased has two full-grown pecan trees that bear an ungodly amount of nuts. Yummm. I will be trying this recipe out VERY shortly. I’m envious of all your fresh pecans, Greta. Hope you enjoy the pecan butter! Thanks, Michelle! Hope you love the pecan butter as much as I do. 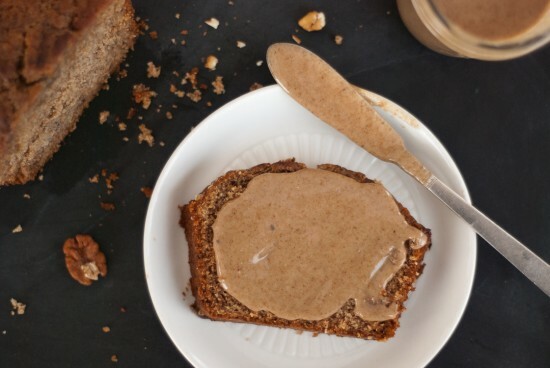 I’ve been craving pecan butter lately, I am wondering if this can be made with a Vitamix. Wonderful will definitely try this out, do you think this could be added to ‘homemade’ butter pecan ice-cream rather than the ‘actual nuts’ as well? Thanks for the great idea. I bet you could use it that way! It should work like peanut butter in peanut butter ice cream. Here’s a recipe for peanut butter ice cream. If you make creamy pecan ice cream, can I please have a scoop? Oh man, your pecan butter muffins sound wonderful! Glad the pecan butter turned out well for you! Just whipped up a batch and it’s delicious! Glad to hear it! Thanks, Tara. I tried this today and it worked wonderfully, but my only fear is that it may have become toxic. I continued to pulse the processor even though the sides of the container began to warm up because of the friction caused by the high speed blades. After my pecan butter was finished, it was warm and smelled amazing except it was also mixed with the smell of burning plastic. Should I still eat it? It tastes good, but it has this weird toxic flavor. Is it because I may have mixed some of the pecan shells in. Is that weird flavour normal? Cathrina, I’m so sorry I didn’t answer sooner. I would not recommend eating anything that smells or tastes toxic. I’m concerned that your processor’s plastic container might contain BPA, which is not a chemical that you want in your food. If you want to try making it again, definitely stop blending as soon as the container starts warming up, and wait until it cools down to try again. The best solution would be to buy a higher quality food processor or blender with BPA-free bowls. Just made my first batch! YUM! I made enough for one mason jar. Now I’m enjoying scraping the bowl with the leftover warm pecan nut butter with crisp slices of apple. Oh my.. wherever heaven is, surely this deliciousness is there. Karin, so glad you’re loving the pecan butter! I can’t get enough of the stuff. bummer. It started off SO good. Then, I added too much salt, THEN I tried to dilute it with more pecans and over-proceessed it. Make sure you don’t overprocess- it’ll ruin the consistency. Before I added too much salt it was REALLY GOOD. Of course adding a tablespoon of local honey made it great too. Hey Michael, I’m sorry your pecan butter went south! Sometimes nut butter can be finicky like that. Hope your next attempt turns out just right. The recipe says 8 oz but then 2 cups. Isn’t 8 oz only one cup? Hi, I’m surely going to try this. How long do you think is needed to toast the pecans in the oven for? My dad has pecan trees, and he always gives me tons of pecans. I found your recipe about three days ago, and made some for my dad. Well, he bought a new processor for me as an early Christmas gift and keeps bringing more and more pecans over. I’m making it as Christmas gifts in little jars. My 2 year old loves it, my husband loves it, my dad loves it and I’m crazy about it! This is the best of all the nut butters! Thank you for another great recipe!!! Awesome! So glad you are all enjoying the pecan butter, Lindsey. Just made this for the second time. Wonderful. My husband just brought me 220 pounds of pecans from our place in GA (I’m in CT), so I’ve got a lot of shelling to do, but this will be a great way to use them! We didn’t have a great year so our nuts could be a little sweeter, but no problem. I added a touch of wildflower honey and it was perfect. I’m thinking of this with pear jelly from the farm that I made this fall … how good can it get??? Thanks, Karen! I’m so jealous of your pecan supply, they’re my favorite. Pear jelly and pecan butter, yes! Will try this out, now how about a recipe for butter pecan” flavored” ice-cream, with REAL pecan flavor? Thanks. Kate, I made this tonight and it is oh so good! Thanks for posting this recipe! I’m another one who tried this recipe and failed… it turned out grainy and kind of almost a bland chalky taste, while actually somewhat oily as well. The pecans were fresh picked from our tree and are xlarge delicious paper shell pecans that I shelled myself this afternoon just for this recipe. Perhaps I didn’t let them cool long enough before processing or maybe it was my old Ninja blender with the food processing blade I used. Either way, a smooth consistency was never obtained. I am going to try adding other ingredients that I’ve noticed some other recipes used (ie:butter, brown sugar & vanilla, or maple syrup & butter w/cinnamon )to see if I can salvage it. I made it! I’ve tried many times to make nut butters in the past and thought I failed again with the pecans, but your comment that it took up to 15 minutes kept me going. It worked and I now have some delicious pecan butter with no other ingredients. Thank you! Excellent! Happy to hear it, Lora. Thank you for commenting to let me know! I have just made and sampled a batch of pecan butter. I have been hoarding the pecans in my freezer that my family bring from the U.S. when they visit me here in the U.K. I only thought of pecan nut butter the other day and absolutely love it. Sadly I think my pecans are a little tired so it means that I’m not getting the full wow flavour you talk about with the fresh nuts. I’ve never had the opportunity to try really fresh pecans, but I do have a lovely hazel tree that yields well, so long as I beat the squirels to the nuts, so I shall definitely be putting hazelnut butter a try. I already make Almond butter but Pecan is my number 1 so far! And I love the little bit of cinnamon you suggested. Thank you for the tips! It also really helped reading the comments and learning by everyone else’s mistakes. Just a pity the others didn’t get the hoped for results. Thank you, Esther! I’m glad you enjoyed your pecan butter! I tried making hazelnut butter once and I over-processed it. The oil separated from the “meat” and it wasn’t so good. Be careful with that one! PS Not sure what just happened but I added 5 stars and managed to change without realising. Oops! But this is definitely a 5 star recipe. Yum! I’m sorry it didn’t sit well. Are you sure it wasn’t the coffee? I think you could use it in place of the peanut butter in these cookies. I was thinking about making some almond butter cause I found some on sale recently and really liked it but when I went to buy more it was so expensive. Anyway, I have about half a bag of almonds and was thinking about making my own. Then I was thinking about all the pecans we just picked up from our pecan tree in the back yard and thought, “I wonder if there’s such a thing as pecan butter?” I never heard of it before. So I did a Google search and sure enough, I found pecan butter. The first recipe I found had vegetable oil as an ingredient and I didn’t like that so I went back and found your site. I love it and can’t wait to try pecan butter. I love nut butters. Thanks for the recipe. For some reason it won’t let me give more than 3 stars, I don’t know if it’s my phone or what, but I wanted to give 5 stars but can’t get more than 3. Hi Michele! I’m glad you found my recipe and hoped it worked great for you. I LOVE pecan butter! loved it!!! Making it again tonight. I don’t tolerate almonds so this is fabulous! I really do not think my blender would run 10 minutes without burning up? Are you sure you aren’t talking seconds? Hi Bob! I’m sorry for my delayed response. I just revised the instructions so they’re more clear. You really only need to run the blender until your pecan butter is sufficiently creamy, and the length of time required will depend entirely on your machine. Ok, so I just made this and realized I should have been doing this a long time ago. This pecan butter is 100 times better than anything I’ve ever bought in a store! And it was so easy to make I couldn’t believe it. So I used the smaller bowl on my food processor and it took less than five minutes. Definitely needed to scrape down the sides but this was no biggie. When it’s done, it’s the most gooey, warm goodness you’ve ever tasted. Thanks so much. My brother-in-law was given 70 lbs of in shell pecans from a friend who has a Georgia pecan orchard. After giving away about 20 lbs we still had 50lbs to shell. After many long hours on the patio we now have about 25 lbs of shelled pecans and not enough room in the freezer. Now instead of peanut butter I’ll be making pecan butter. Can’t. Wait to try it. How much of a serving constitutes for a meal? Would toast, pecan butter, and fruit be a complete meal. The pecan butter is filling. I made a batch……..oh it is So GUD!!! I think that’s entirely up to your appetite. Whole grain toast, pecan butter and fruit would be a fine breakfast or lunch, in my book! Hi Kate I tried it in our high speed blender, and it worked! It looks exactly like the one in your photos! It tastes great! Thank you and God bless you! I don’t know why pecan butter didn’t cross my mind earlier. I make my own peanut and almond butter all the time and I love pecans. I just made this and it’s already my favorite. Mine is definitely more subtle than other nut butters I have made. Thanks for the toasting and cinnamon tips. Divine! Awesome! I have to try this. Dare I ask for a glutan free pecan butter cookie recipe?!! Make this recipe regularly!!! Absolutely in love with it. It is very adddictive..watch out! Can’t wait to try this. I’ve searched for years for a Pecan Butter that works with no success. The liquid to dry was never right and I lost a lot of money in Pecans. So I will try this one and report back. Thanks so much for the recipe. We served this on Minimalisr Baker’s Pumpkin Spice Latte waffles. Sooo delicious!! Thank you for your recipe!! Made this pecan butter today in my food processor! It was so easy. I was amazed at how few ingredients were needed. Yes! So simple and a real money-saver. Thanks, Dawn. this recipe sounds great….it was the first that popped up on the google search! just wondering…how long does this last for in the fridge? Hi! This sounds amazing! 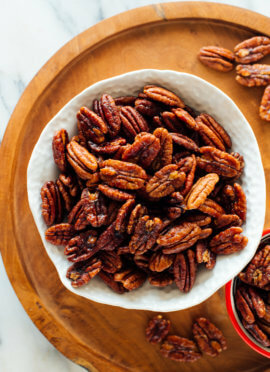 Like many others here I absolutely love Pecans! I was just wondering how you store it, and how long it lasts? Does the finished product need to be refrigerated? Hi Garnet! I just added recipe notes on that subject; I’m sorry for the confusion. It’s best stored in the refrigerator, and I think it will last for about 1 month. Which Vitamix did you use? Hi Donna, I used a food processor when I first made pecan butter. Any full-size Vitamix or Blendtec would work great. I currently use a Vitamix 750. Delicious. I usually make cashew butter, but this is a nice change. Great on apple slices or sweet potato slices instead of bread. Just made some pecan milk, and I’m going to try roasting and making butter from the leftover pecans. <3 <3 Thanks for the recipe! Sounds delicious, Adie! You are very welcome! Oh my goodness, I’m eating my pecan butter on toast right now and can’t believe how delicious it is! And SO easy to make! My food processor isn’t the best so mine isn’t completely smooth, but it doesn’t even matter. The taste is amazing. Thanks for another great recipe! Right?! It’s so good. Thank you, Jo for your review. I’m allergic to all nuts other than pecans and found out that sun butter is a food sensitivity. It was great to find this recipe, the pecan butter on the web is so expensive. I made it this morning in my old food processor and it only took a couple of minutes. It tastes great and was much less expensive to make. Thank you! I’m glad you found one that works with your allergies! Thank you, Deedee for sharing! I just made this yesterday. At first bite I wasn’t sure how I felt about it because I’ve never had it before but I could eat this by the spoonfuls. It’s so good. If you have any tips on a hazelnut butter or combo I’d be interested. Yes, spoonfuls! Thanks so much for the review. Love this recipe! Thank you! I often add coconut (sometimes toasted, sometimes not) to the mix and a little stevia to sweeten. So good!! I also added some toasted macadamia nuts and coconut to the mix one time- it was so good as well (just cant afford to always have macadamia nuts around)! I love how versatile this recipe is! Thank you, Angela for sharing. I appreciate the star review! First time making a nut butter. I have organic pecans on hand. Thank goodness you explined pecan “crumbs” would turn creamy with a bit more blending! It was no more than a couple of minutes to that transformation. So good! Thanks! I subscribed to your email updates. Looking forward to the next adventure. Wonderful! Pecans are my favorite nut. Have never made a nut butter before. So simple and no extra oil. I’ll make this again and again, I’m sure. Lovely, Pat! Thank you so much for your review. YUMMMMMM!!!! Thank you so much for this! I even loved your vacation blurb, I want to replicate that trip ASAP. But this pecan butter is bomb.com!! Super easy too, I used a ninja food processor. The nuts needed some serious chill time though, those buggers we’re HOT. I’d recommend pouring them in a glass dish to cool down rather than the plastic processor, just a thought. I especially loved the cinnamon addition, I’m a cinnamon fiend (I add it to my coffee grounds, so lovely). Thanks again! I’ve already recommended the recipe. You’re welcome, Kathy! Thanks for sharing and for your review. Just made some pecan butter and it’s amazing! Thank you for the insight! I soaked and dehydrated raw pecans, and threw them straight into the blender so they were still a bit warm from the dehydrator, and it worked great! My blender is not the best, but it still only took a few minutes. Question: if I were to put 4 cups of nuts rather than just 2, would it still work you think? 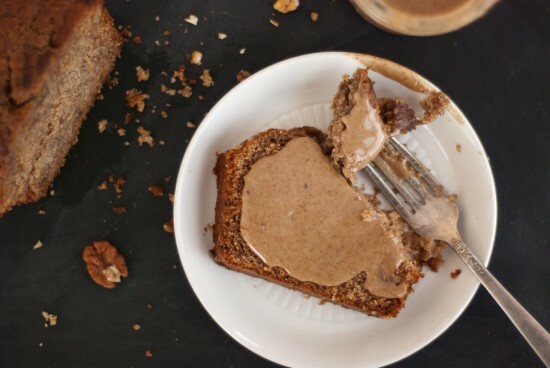 I tried making nut butter last year with more than 2 cups and it just wasn’t happening. But I was trying to mix cashews and almonds for a 2-nut butter, so not sure if it was quantity or type of nut. Let me know your thoughts, and thanks again! You’re welcome! I would think that would work as long as you increase everything by the same. Let me know! THIS! OMGoodness, so good!Was looking for a Keto friendy recipe and this was it! I had a bag of left over, whole pecans in the fridge from another recipe so decided to use them up this way. Very rich and flavorful. YUM! Great, Wendy! Thanks for your review. So super delish!! So happy it’s also super Keto!! Thank you for your review, Ruth!